Lisa Galimberti arrays the beds of some of the most prestigious houses on the planet. From standard sizes to tailor-made requests, you can find our beddings on yachts and boats on all oceans. So that our guests can sleep on-board yachts in sheets as soft and comfortable as those our clients have at home. All our beddings can be made on request to the shapes and dimensions of the sleeping area of your cabin. Lisa Galimberti introduces you to her finest bed covers for luxury yachts and sailboats. The bed set named PORTO FINO reminds us of the “Dolce Vita” of this small village on the Italian Rivera. Southeast of Genoa, the village of Portofino is famous for its fishing port lined with super yachts. 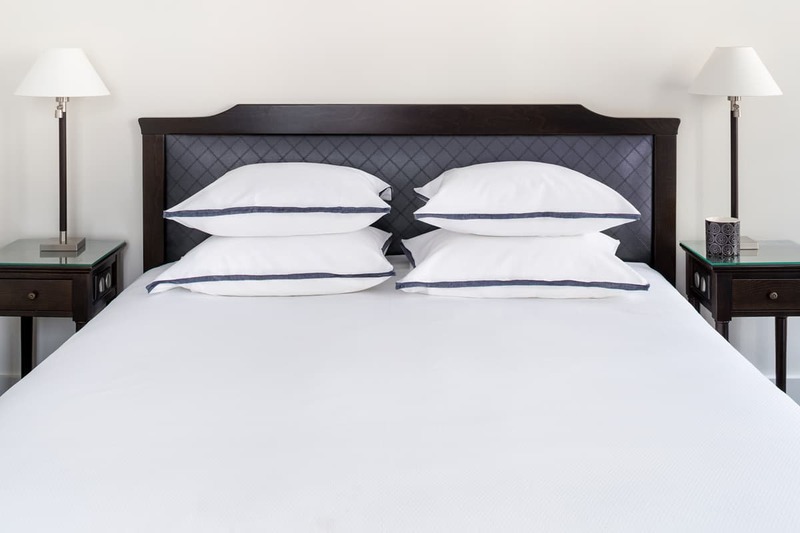 Our bed set consists of a white cotton piqué bedspread and pillowcases with 4 accordions in blue herringbone, is ideal for doing the beds of the most prestigious yachts and boats, it is available in standard sizes via the site. Ask for the making of your own bed linen by contacting the offices of the brand directly. Our bed linen in marine colours, in combed cotton percale 406 threads crossed by strips of pure satin, takes its name after the islands of Lipari in the Tyrrhenian Sea, otherwise called the Aeolian Islands. The high-end bedding set matches perfectly with the decoration of a boat cabin. To adapt these sheets to the bed of your yacht or your boat, contact Lisa Galimberti and ask for their creation. Located in the north of Sardinia, the waters of Porto Cervo welcome each summer a ballet of yachts and sailboats. The port of Porto Cervo is one of the most coveted destinations for yachting in the Mediterranean, and Lisa Galimberti has created the bed linen named PORTO CERVO, to represent this luxurious seaside resort. 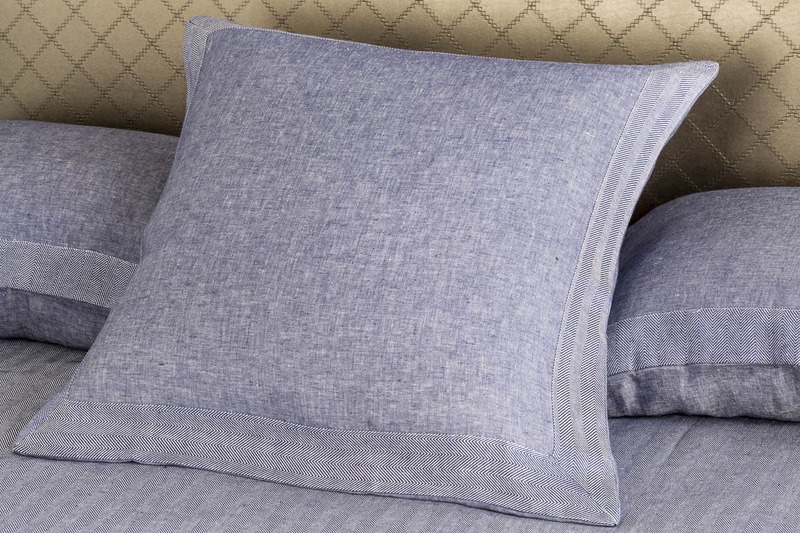 The denim-coloured bedspread and pure linen pillowcases are embroidered with herringbone for a sporty & chic design. Our “Porto Cervo” is a bed set, perfect for yachts and sailboats. The bedding set named PLISSES is a classic Lisa Galimberti. With a choice of 13 different colours, you will certainly find in the range PLISSES, the bed linen that goes with your boat. 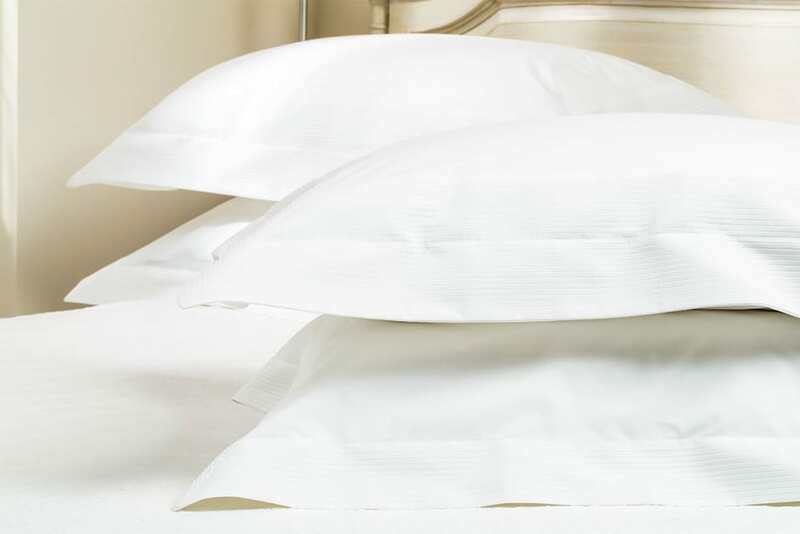 Made of long-staple cotton percale, this bedding brings elegance to your yacht’s cabin and the softness to your nautical nights. To order the PLISSES sheets to the measurements of your cabin bed, please check the sizes available on the website, or contact Lisa Galimberti for a tailor-made confection. Lisa Galimberti it’s more than 30 bedding sets, all available in several sizes and colours. Browse our site and view all models to choose the best yacht bedding that will best suit your ship’s décor. 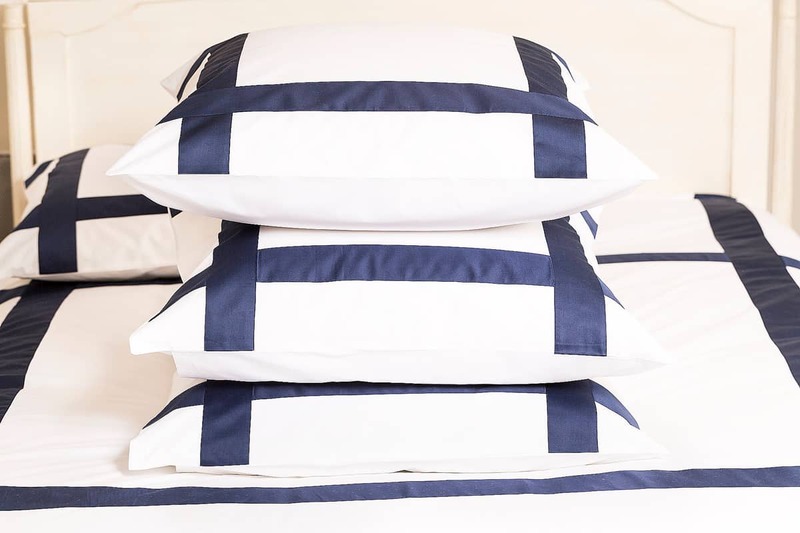 All our bedding sets are available in standard sizes via the site, to order a size or a custom shape according to the berth of your boat, please contact us.